The Roman Baths in the sea capital Varna are one of the largest historic landmarks in the city. The Roman Baths are unique in nature because they are among the best preserved monuments from the ancient period in Bulgaria. Today the Roman Baths are located in the southeastern part of modern maritime capital, near the port. They represent the largest Roman bath on the Balkan Peninsula and are the largest antique public building, remaining in the country. It is amazing how well they have managed to preserve the Roman Baths until today. Today, relatively full-preserved walls of the complex outline an area of 7000 square meters The architectural style of the Roman Baths found in the region around ancient coins are a testament to the period in which they were built and functioned. 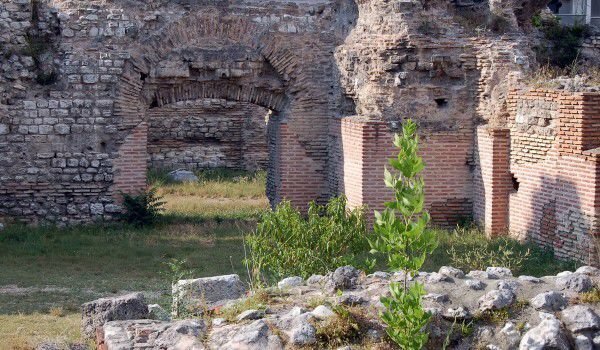 Most likely the baths were built at the end of the second century and early 3rd century, have been used somewhere until the end of the third century. In those ancient centuries the Roman Baths were the height of the arched structures, up to 20 meters thick walls were built with specific technology, they have alternated stone wall with five or six lines of clay solid bricks. Huge boulders form internal stairs and the arches of the doors. Even today there are fragments, showing that the Roman Baths were decorated with magnificent mosaics. Lavish decoration of the complex is attested from very decorative marble fragments, columns and capitals. The Roman Baths had been one of the most important and socially significant buildings of the ancient Odessos that of 15 BC becomes part of the Roman Empire in the province of Moesia. Odessos retains some autonomy, had the right to coin its own money and no Roman garrison. Baths in Odessos are a testament to the great influence of Roman culture in this major port of Moesia. Heating system at the Roman Baths is an achievement of hydraulic engineering at that time. It involves a double floor and special cavities that lead warm air to the top of the building that was erected near thermal springs, and operating today in Varna. Visitors to the bathrooms come first in the spacious rooms, which are providing a natural barrier to cold air. Then come into a huge hall called balestra that was kind of a center. In this large room, were gathered the princes of Odessos to discuss important public issues. The first professional opinions of specialists archaeologists and historians on the Roman Baths begin far before taking archaeological excavations in the area. Even in 1906, Austrian scientist E. Kalinka determined the building as ancient remains, but the greatest contribution to the induction of scientific interest in the ancient complex, respectively, and to maintain his brothers had Shkorpil. Among the priceless antiquities discovered during excavations in the Roman Baths in Varna are figures of Claudius, statues of Roman gods Hercules, Victoria and Mercury, which is supposed to have served as decoration of the spacious rooms in the complex. In the northwestern part of the baths were discovered shrine deities protectors of health Asclepius and Hygeia. Nowadays, during the summer months the Roman Baths in Varna and extensive premises are suitable for an outdoor theater, at which are held various concerts.